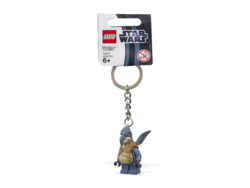 853413 Watto Key Chain is a Star Wars Key Chain featuring Watto. It was released in March 2012. This is a description taken from LEGO.com. Please do not modify it. Grip the steeling wheel with Watto by your side! It’s always a great deal to have the junk-dealing legend of Tattoine in the passenger seat! With a sturdy metal ring and chain, this authentic Watto is a great travel companion – in any galaxy! Makes a great gift for LEGO® Star Wars™ fans! Facts about "853413 Watto Key Chain"
Grip the steeling wheel with Watto by your side!